Name of dog you are inquiring about? These questions are aimed at making sure you understand the responsibilities that come with caring for a husky or malamute and to assist us in placing the right pet with you. 10. 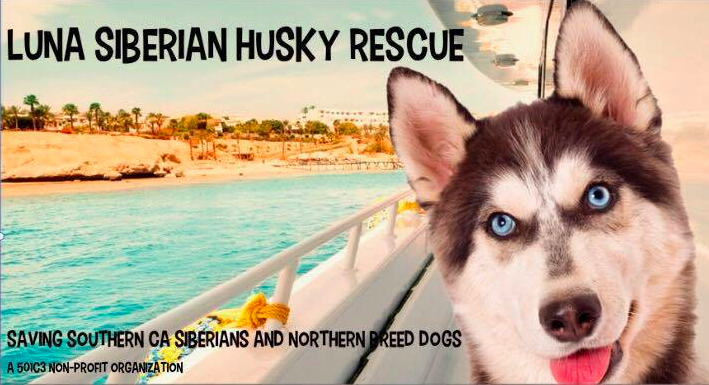 Is there anything else you would like to tell us about you, your family or your interest in fostering a siberian husky? The more information you provide, the better we will be able to determine suitability of a particular dog. If so, please list their ages . I agree that the named Siberian Husky is being fostered by myself and will not be sold, adopted, or given to another party under any circumstances. I agree that the foster dog will not be allowed off my premises unsupervised. When taking the dog out or travelling by car, I shall remain vigilant at all times and he/she will be secured by a harness and/or collar, and will wear an ID tag. The foster dog will not be allowed off leash in public areas. If requested to do so, I shall keep the foster dog apart from any other animals. I will contact Luna Siberian Rescue immediately if the foster dog is lost or stolen. Shanne- 760-218-9989, Derick-760-449-4700 I will make every reasonable effort to recover the dog. I agree that the foster dog will be a companion animal and will live as part of my family, he/she will not be used as a guard or hunting dog. The dog will not be kept as an outside pet. I agree to care for the foster dog in a humane manner. This includes providing adequate, food, water, shelter, exercise, attention and veterinary care. I understand that foster dogs may need extra patience and understanding and I agree to allow the foster dog a reasonable time to adjust to new surroundings. I agree that if I have any training issues or difficulties of any kind with the foster dog, I will contact Luna Siberian Rescue Inc. immediately. I will not alter the foster dog's appearance in any way, shape or form. i.e. cropping, docking, colouring, except for routine grooming. I will allow a Luna Siberian Rescue Inc. representative to make periodic visits to my home during the foster care period. I understand and agree that Luna Siberian Rescue will only cover pre approved veterinary expenses for the dog, by a Luna Siberian Rescue Inc. authorised Veterinarian. Luna SIberian Rescue will not reimburse any unauthorized expenses. I understand and agree that it is a Luna Siberian Rescue Inc. requirement that the foster dog will be spayed/neutered by a Luna Siberian Rescue authorised veterinarian when the dog is well enough to do so. I agree to keep Luna Siberian Rescue Inc. updated with my current contact details and will notify them of any plans to move or travel, with or without the foster dog. I agree to notify Luna Siberian Rescue Inc. of any change in circumstances that may prevent me from providing foster care at any time during the agreed foster period. I agree to return the foster dog to Luna Siberian Rescue Inc. in good condition, if at any point or for any reason Luna Siberian Rescue Inc. requests that I should surrender the dog, without requesting a fee. I will immediately notify Luna SIberian Rescue Inc. in the event of the dog's death during the foster care period. Should I wish to adopt the foster dog, I will notify Luna Siberian Rescue Inc. and upon approval, shall follow Luna Siberian Rescue Inc. adoption procedures. There is a trial period when adopting a , during this time, all Foster Terms and Conditions still apply. I agree to foster the named dog at my own risk and indemnify and release Luna Siberian Rescue Inc. its director and volunteers, of any and all liability arising from damages to person(s) or property caused by the dog. I have read and fully understand the Terms and Conditions of this agreement and agree that it is not arbitrary and that provisions herein, are common in pet foster care agreements. I further understand, that if I fail to comply with any of the Terms specified herein, Luna Siberian Rescue Inc. has the right to reclaim the dog and to enforce this contract in a court of law.